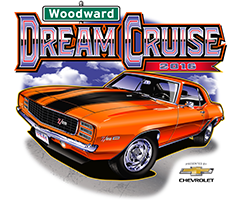 The 22nd Annual Woodward Dream Cruise will take place Saturday, August 20, 2016. This year's event will be showcasing more than 40,000 muscle cars, hot rods, custom and classic cars down the 16-mile stretch of Woodward Avenue. The Woodward Dream Cruise is one of the world’s largest one-day automotive event, drawing 1.5 million people and classic cars each year from around the globe. The event draws guests from as far away as New Zealand, Australia, Japan and the former Soviet Union. Bronco Graveyard is excited to announce that we will not only be participating in the event, but we also will be featured on the Woodward Dream Cruise special on WXYZ Detroit channel 7 on Saturday August 20th, 7pm-9pm EST on ABC. If you miss the first airing you can catch an encore presentation, Sunday, August 21, at 10am to noon. Don’t live in the Detroit Metro area? Check your local listings because the Woodward Cruise special will also be aired as a one hour event on more than 100 television stations across the country between August 27 and September 18!